This product is EXCELLENT. 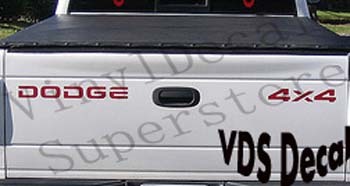 I just had my 1999 Dodge Ram / 4x4 repainted and the tailgate decals were removed in the process. I searched the internet for a replacement. The Vinyl Decal Superstore had EXACTLY what I needed. The price was right. The decals arrived 4 days after I ordered them. I just finished applying them to my truck and they look SHOW ROOM PERFECT. I am extremely pleased and will recommend Vinyl Decal Superstore highly to anyone.